I have just been reminded that a model that I made back in 2003 - ish has never been mentioned on this blog. This is of no surprise because I didn't start this blog until 2006. However, my friend Dan, in Connecticut, New England, has just reminded me about this model - mainly by writing some very nice things about me on his blog. If you can stand it, check out No Facilities. Anyway, back to the story. Dan lives very close to Bradley Airport which not only houses the New England Aircraft Museum but also, and more importantly for this story, was the home of the Connecticut Air National Guard (CT ANG). I have been writing software for Dan's company since 1996 but had only got to meet him around 2002 and now, in 2003, I was going out to spend some time with him visiting his company to discuss future projects, etc. I wanted to take him a present and hit upon a model of an A-10 as he saw these flying over his house as they landed at Bradley. The only model I could get was the Tamiya one in 1/48th scale. This is a very early version but I was sure that Dan wouldn't care and I didn't have the time do a lot of conversion work. Mind you, my idea of "gentle scale modelling" as in the title of this blog probably precludes me from doing such work! I started to realise that, although I could give this a modern paint finish using the kit, or even aftermarket, decals wasn't going to be any good as it really had to be CT ANG or nothing. Needless to say, I had left all of this very late and was extremely pressed for time to complete the model before I had to leave for the trip. 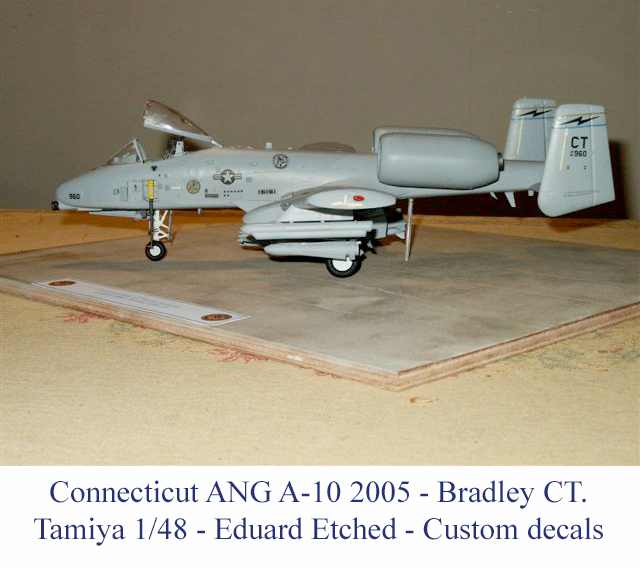 I did a search across the Internet and found that there was some guy in the US that was making custom decals for the CT ANG A-10s. I managed to contact him and, very quickly, there was a set on the way. I was down to about 3 days to go when the decals arrived and, to my horror, I found out that he had sent me the 1/32nd scale sheet rather than the quarter scale ones that I needed. Fortunately, these were too big so scanning them and reducing them would work. Scanning them and enlarging them would have created problems. I scanned them, enlarged them and printed them out on my colour printer. A couple of the set didn't work too well so I had to hand create them from scratch. Fortunately, I used to own a design studio so am quite adept at Adobe Illustrator and Photoshop. With a day to spare, I put the last coat of matt varnish on, glued on the canopy and packed it up in a box ready to go. Fortunately, I did take one photo of the finished article. I packed the model up in a sturdy cardboard box, padded it out with various unmentionable items of clothing in such a way that when I rattled the box, not one bit of the model touched the sides. It then went into my suitcase to go in the aircraft hold. Amazingly, it got to CT unharmed and was duly unpacked and presented to Dan. Here is the sole image that I have of the finished model (you can double click on it for a larger image).